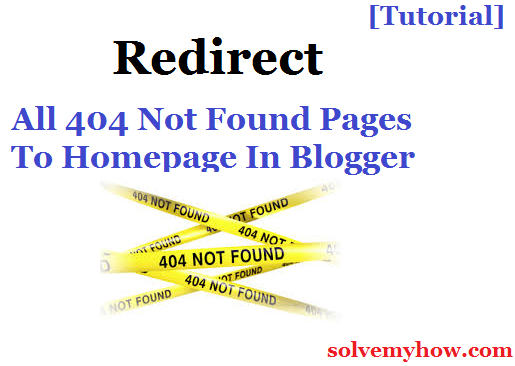 How to redirect 404 page to homepage in blogger ? This is the basic question these days in am getting in my inbox. So, instead of replying individually, I preferred to write the complete tutorial to redirect 404 page not found to homepage. In our blogging industry day by day new things and algorithms use to come and we have to change our blog accordingly. You can read all the best blogging tips in SolveMyHow blogger category. But lets keep this tutorial to the point and lets learn how to fix error 404 error. Well when your user/visitor landed on deleted or non existing URL then they will be shown 404 page not found. So, this is basically 404 error page and its a good sign of blogger to set this page. But when your user see 404 page he/she mostly disappear from your blog. So what to do, to not loose those readers ? any idea ? By adding Java script code. By adding meta tag code (recommended). I have explained both the methods below but I personally suggest you to go with second 1. As adding java script code may reduce you site's speed and it may affect SEO of your blog. Step 1 :- Go to blogger >> settings >> search preferences. Step 2 :- Edit "custom page not found". Sorry, you might have landed on invalid URL. You will be redirected to Homepage shortly. Note: Just change my homepage URL with yours. location.pathname = "http://www.solvemyhow.com/". Here 5000 is the seconds after which your user will be redirected. You can set your own time too. So, that it you're done. In this method you have to do this much only. But I recommend you to go with the next method i.e adding meta tag code. This is the best way to redirect 404 page to homepage, as this won't affect the loading speed of your blog. In this method we will add code in the blogger template. Just follow the simple step by step guide to execute this task. Step 1 :- Go to blogger >> template >> Edit HTML. Step 2 :- Search for <head> part by pressing Ctrl + F.
Now you have to paste below mentioned code just after the starting of <head>. Oops! the Page you are looking for, does not exist. We are redirecting you to Home page. 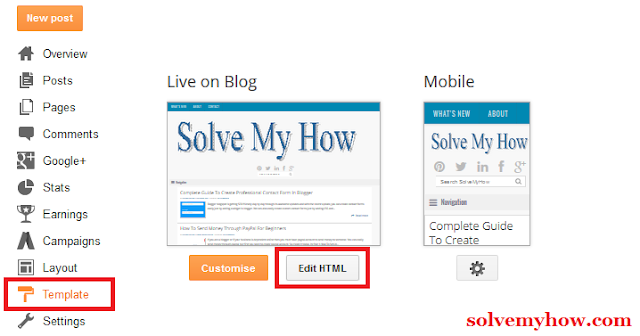 Note: change solvemyhow.com URL with your blog url. Here content=5 is 5 seconds. You can set your own time i.e after how much time you want to redirect. You can also set it to zero(0) if you wanted to redirect 404 page to homepage immediately. Step 3 :- Save template. How To Redirect 404 Error Page To Any Specific Page ? It might happens that you do not want to redirect your users to homepage. You may wanted to redirect them to any specific post or page. So, in that case what to do ? Well answer is very simple. Just select any of the above method and instead of giving your blog url, give url of your specific post or specific page. Let me take the example of method 2. So, look at the code below. Its totally same, I just changed the URL of my homepage with the url of specific page. You can see the change in the meta content part. So this was the complete guide to redirect 404 page to homepage in blogger. I have tried my best to explain this tutorial in step by step process. Hope you found this tutorial informative and worth reading. Do let me know if you have any query or if you are facing any difficulty, in the comments below. 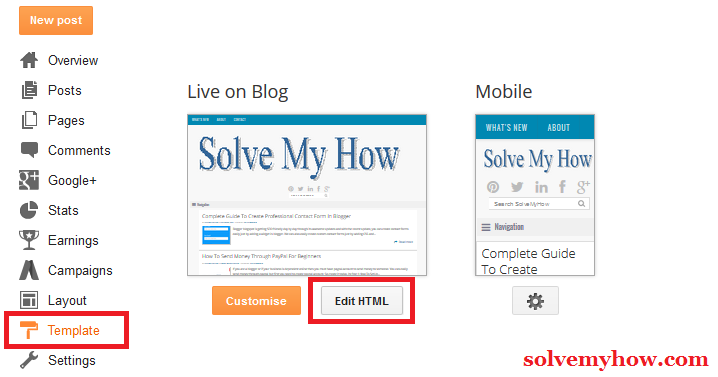 You can also subscribe for SolveMyHow newsletter to get best blogging, SEO and make money online tips right into your inbox. Found this tutorial interesting ? Why not help by shooting those social media buttons below, after all "sharing is caring" right !